were normally plain, while the ones of women often had decorative desgins. Those hats were waterproof and gave protection from the elements.In winter fur hats were preferred by the Modocs. Hi cinemo! Then you think that the old caption is wrong? the caption ( name ) is right, but the man is not the Modoc leader. 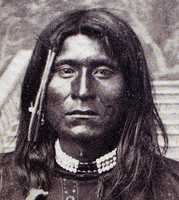 That photograph shows Captain Jack or Green Leaf, a chief of the White River Utes . I recently purchased the following photo at a garage sale and was just curious what anyone can tell me about it. I have not been able to locate anything specific about a Chief Sky from the Modoc Tribe in 1934. I was just wondering if anyone had any additional information about where this photo may have been taken and its authenticity? Thanks so much in advance. Looking at the images side-by-side, it is doubtful that the image dated 1863 is really Kintpuash (Captain Jack) - note the shape of the brows, nose and most importantly the mouth which on the authenticated image is far wider. To me this alleged earlier photo of Kintpuash is most likely someone else. Over the years in my research I have come across numerous incorrect attributions of photographs of historical persons that ended up getting published and then were unscrupulously perpetuated in later publications using the earlier one as reference and considering it historical fact. Serious historians ought to be careful making too quick assertions without due research and verifying proper source references. Now this questionable image of Kintpuash is depicted on the Wikipedia page (Captain Jack) and I fear yet again it will end up in future publications as the "real" thing. Same happened with Morning Star a.k.a. Dull Knife of the Northern Cheyenne, a subject that is being discussed on another page of this forum. I think the shirt and boots are surely not traditional. Does Cheewa James comment on how authentic the portrait of Captain Jack is, Cinemo? And have you read her book and recommend it? In my archive I found this other photo of Captain Jack, but you probably already know. Hello Californian, thanks for your input here. I too was interested in the subject, the two photos and wether the one in more traditional dress is Capt. Jack / Kintpuash the Modoc or not. I´m not sure either completely, but there is a close similarity I thought and there are about ten years in between when the photos were shot. Concerning the third photo in your last post, this is to my information showing the Ute warrior Jack / Nicaagat, not the Modoc chief. hi Chicheman, thank you very kindly for your interesting comments and deductions. It seems that the contemporary Modoc nation is painfully aware of this mixing of two persons with the same name but from different tribes as is being discussed on this site: modoc-nation.blogspot.com/2016/11/you-dont-know-jack.html. 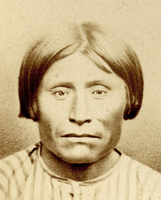 I don't think that Jack of the Ute nation is the same person depicted in the below image widely used in print media and the net as depicting Kintpuash of the Modoc. Hopefully in due time his true identity can be determined. Sadly even the Gene Autry Museum in Los Angeles feature this particular image as Capt Jack the Modoc which author Robert McNally of the recent “The Modoc War – A Story of Genocide at the Dawn of America’s Gilded Age” has used. I fear that now it is in an authoritative printed book this misattribution will end up getting endlessly perpetuated.